This is the best cellphone photo I got during the Scott Weiland and the Roundabouts performance. I wish I has brought a better camera! 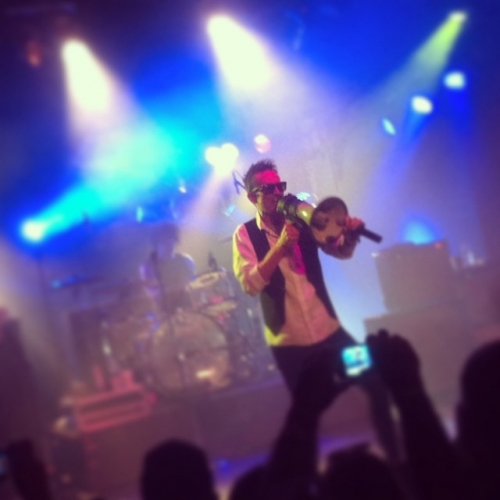 This is the story of how I took some really low quality cell phone photos of Scott Weiland…. Way back in 2002 I saw Stone Temple Pilots at The Beale Street Music Festival in Memphis, Tennessee. I will never forget how they opened the show with “Shine on You Crazy Diamond” by Pink Floyd. I was blown away! At the time I was working at a photography studio in Florence, Alabama and I applied for a photo pass, but was denied. Boooo!! I was disappointed, but it was worth a try. I would have loved to photograph those guys. (Plus it would have been great to see the show up close and not from 100-yards away!) Regardless of my proximity to the band, my buddies and I were lucky enough to see one of our favorite bands perform during the prime of their career. Fast forward to 2015….When I heard that former Stone Temple Pilots leader singer, Scott Weiland, was going to be within driving distance of Panama City Beach I jumped at the chance to see him perform some of my all-time favorite songs in person. My wonderful wife bought us tickets to go see Scott Weiland and the Wildabouts at Club LA in Destin, Florida on March 7, 2015. The band performed new original songs along with some of my favorites STP hits Big Bang Baby, Crackerman and Vasoline. I did not think they would allow cameras into the venue so all I brought was my iPhone 4. As you can see by the photos on this page, the iPhone 4 does not do so well in a dark nightclub. I wound up taking a dozen or so camera phone photographs and then cooled it with the photos and just enjoyed the show. I knew this would probably be my only chance to see these guys is such a small venue and I wanted to really enjoy the experience. Little did anyone know that Jeremy Brown, guitarist for the band, would be dead a couple of weeks later. On top of that, Scott Weiland himself would be dead less than a year after this performance.